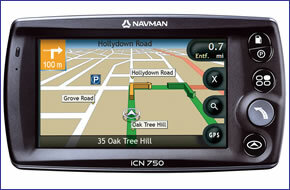 The Navman iCN 750's innovative GPS navigation is pre-installed European maps and has a 4GB hard drive. It integrates with the optional Traffic Module which delivers real-traffic updates directly to your Navman. You can import your own points of interest (POIs) and NavPix-referenced images, such as speed cameras, to personalise your route planning options. Navman iCN 750 has been discontinued. Accessories, spares and parts are still available for your iCN 750, as are road maps. The top-of-the-range Navman iCN 750 is pre-installed with European maps and.includes the latest GPS navigation software, ensuring reliable and accurate navigation to your chosen destination, as well as an intuitive display and high visibility, state-of-the-art 4-inch widescreen. Alternatively listen to road-specific voice guidance instead. The Navman 750 NavPix software integrates the geo-tagged images with the pre-loaded maps on its 4GB hard disk, which also ensures you have plenty of room to store your NavPix. And then simply select an image as your destination or a point en route. The Navman iCN 750 includes Fuel and Park buttons as standard to give you an easy way to find the nearest petrol station or parking facility. There is also the Home button to automatically plan your route home at the touch of a button. And if you do make a wrong turn or miss a manoeuvre, the Back on Track software puts you back on your right route automatically, ensuring that the best route is calculated without having to do anything. You can import your own points of interest (POIs) and NavPix-referenced images, such as speed cameras, to personalise your route planning options. The Back on Track software will also put you back on your right route automatically if you miss a turn, ensuring that the best route is calculated without having to do anything. The Navman iCN 750 integrates with the optional Traffic Module which delivers real-traffic updates directly to your Navman (France, Germany and the UK). You will then know in advance about any problems on your route and automatically recalculate your route if you want. Furthermore, once you have bought the Traffic Module, there are no additional subscriptions for the traffic updates. Instead of text and numbers to set an address when route planning, NavPix lets you use images to select the destination. The NavPix technology combines a digital image with highly accurate geographical information to create an exact, unmistakeable way to choose a destination when calculating a route with your Navman. You create NavPix images either by taking a picture using the integrated camera on your Navman or by using the NavPix software on navman.com to add geographic information to one of your own pictures. You can also download NavPix from the Navman website, find them on other sites or even share them via email. So you can select the image that best identifies a specific destination, without having to remember long or complicated addresses. The Navman iCN 750 has been designed to be Plug & Play, and as such can be transferred from vehicle to vehicle with ease by the user. The Navman iCN 750 is powered with a 12-volt adaptor cable in-car. The provided mains A/C power adaptor allows for use in the home or office, when configuring a route (cables included). The Navman iCN 750 works with Tele Atlas Maps to provide detailed maps of across Europe. Tele Atlas Maps provide high quality, detail rich maps, which in addition to street information include features such as route calculation, Points of Interest, Estimated Time of Arrival, and more. Further Navman iCN 750 maps are available SD card which insert directly into the Navman iCN 750. Available Navman iCN 750 maps include, Western Europe, North America, Australia and New Zealand. View the complete range of maps available for the Navman iCN 750. Although the Navman iCN 750 has been discontinued, a number of accessories are still available to buy from ActiveGPS. These accessories and spares include: vehicle power cable, windscreen suction mount , mains power charger, remote control and external GPS antenna. Navman iCN 750 maps on DVD and is supplied with 2007 TeleAtlas map data for either UK and Western Europe, USA and Canada or Australia.